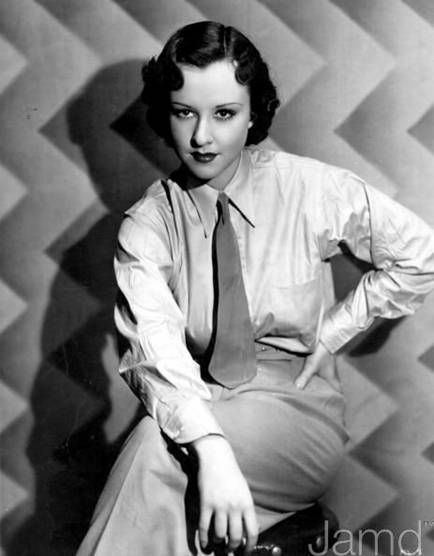 Active - 1932 - 1974 | Born - Sep 19, 1910 in Dubuque, IA | Died - May 9, 1981 in Los Angeles, CA | Genres - Drama, Mystery, Crime, Comedy, Romance | Height: 5' 5"
Picture-pretty brunette Margaret Lindsay was one of a number of pleasant, sweet-natured ingénues who could do no wrong in a score of 1930s stylish Hollywood pictures. Such altruistic love interests were often overlooked in pictures that were carried by the flashy histrionics of a jaunty James Cagney or temperamental Bette Davis, both of whom she supported in several films. Ergo, while she was a lovely distraction and a highly capable talent, Margaret failed to ignite and command the attention of a truer star. The Dubuque, Iowa-born lovely was christened Margaret Kies in real life, the eldest of six (she had four sisters (Helen, Jane, Lori, Mickie), one brother (Jack)). Her father, a druggist, enrolled her at the National Park Seminary in Washington, DC. The acting bug hit Margaret quite early, however, and she subsequently attended New York's American Academy of Dramatic Arts to pursue her dream. Unable to find work in New York, she traveled to England for further speech and acting study. Here she made her professional stage debut and gained experience and confidence in such plays as "Escape," "By Candlelight," and "Death Takes a Holiday". With her resume now consisting of strong theatre credits, she returned to the States hoping to finally make a mark on Broadway, but again her career stalled. While waiting for a show of hers to open following production delays (eventually she co-starred on Broadway opposite Roland Young in "Another Love Story"), Margaret had a number of screen tests arranged for her. Shelving her Iowa-based roots, Universal took an interest in the "British stage actress" and signed her on. She made her debut in Okay America! (1932) and toiled in a few minor roles before taking full advantage of her "English tea rose" reputation with a small but noticeable part in the "all-British" grand-scale epic film Cavalcade (1933) as an optimistic honeymooner on board the fateful H.M.S.Titanic. Warner Bros. then picked up her option and began featuring her gracefully opposite such magnanimous stars as Leslie Howard, Douglas Fairbanks Jr., George Arliss and Humphrey Bogart. "Americanized" as a lead and second lead, she was able to drop the British pretense and appeared opposite Cagney in Lady Killer (1933), Devil Dogs of the Air (1935), Frisco Kid (1935) and 'G' Men (1935). The studio had her work as a second-lead to Ms. Davis as well in such films as Fog Over Frisco (1934) and Bordertown (1935). Of note, she supported Davis in both her Oscar-winning "Best Actress" pictures -- Dangerous (1935) and Jezebel (1938). She also took on a Davis castoff role in Garden of the Moon (1938), a musical in which Margaret did not sing. Margaret's longstanding problem was that she was either involved in minor pictures that would do nothing to advance her career or was handed oblique secondary roles in "A" pictures wherein she played the star's best friend, light romantic rival or socialite. One of Margaret's sisters, Jane Gilbert was briefly an actress in the late 1930s/early '40s and was once married to Perry Mason (1957) co-star William Hopper, who played private investigator Paul Drake. Following one of her best roles as Hepzibah in Nathaniel Hawthorne's The House of the Seven Gables (1940), Margaret signed up with Columbia in the recurring "Ellery Queen" series (seven in all) as mystery writer Nikki Porter opposite either Ralph Bellamy or William Gargan's title crime solver. Probably her best remembered role, this renewed popularity did not guarantee "A" pictures and she remained for the most part in second tier filming. One of her more atypical roles came as a man-baiting saloon girl in The Vigilantes Return (1947). In the 1940s, she replenished her film resume with secondary ladylike roles behind Joan Bennett in Scarlet Street (1945), Lana Turner in Cass Timberlane (1947) and Barbara Stanwyck in B.F.'s Daughter (1948). Margaret also sought work on TV and on the legit stage in the next decade. Her final film was in typically pleasant mode as Nurse Colman in Tammy and the Doctor (1963) showcasing a nubile Sandra Dee. Margaret never married in real life but remained close to her family. Her dating companions were typically "safe" stars such as Cesar Romero, Richard Deacon, and even Liberace. For much of her time in Hollywood, Margaret shared a home with a close sister. She died at age 70 in Los Angeles of emphysema in the spring of 1981. Sister-in-law of actor William Hopper. Her close companion was actress Mary McCarty. A good friend of actress Thelma Todd, she was at a dinner given in Todd's honor the night of Todd's mysterious death from carbon monoxide poisoning. Margaret was so distraught that she had to bow out of a picture she was filming Murder by an Aristocrat (1936). Marguerite Churchill was given her assignment.